Welcome to the home page of SUSIE DAVIDSON, journalist, author, poet, filmmaker and social and environmental activist. Presently, I am a contributor for The Huffington Post (now HuffPost) and The Jewish Daily Forward. This is the best article that's ever been written about me. Thank you so much, Susie! -Sean Altman, Jewmongous! "The Holocaust: Memory and Legacy"
With music by Ronnie Earl. Narrated by WBZ's Jordan Rich. Feel free to share or use this as you wish. If you know any classrooms that might like to use this for their Holocaust Education programming, please send these links to them with my contact info. There is no charge of course, but I would like to know who uses it for educational purposes. Thanks very much! Congressional Delegation Speaks at April 29, 2017 Peoples Climate March in D.C.
"The Last Waltz 40th Anniversary Tribute at the Orpheum Theater, Boston (please like and share on your computer or desktop version, thank you! ):"
"Area police take part in Shabbat dinner"
Information on NEW DOCUMENTARY FILM "The Holocaust: Memory and Legacy", featuring Boston-area Holocaust survivors, children of survivors, Holocaust educators and liberating World War II soldiers, and music from blues virtuoso Ronnie Earl, Klezmer musician Glenn Dickson (Shirim, Naftule's Dream), the Terezin Chamber Music Quartet, and singer Rosalie Gerut. The book and film were just incorporated into the Coolidge Middle School and Reading High School, Reading, Mass. as new resources for lessons about the Holocaust. They are being used in the second year of the 9th grade advisory program, which will study Tolerance and Diversity this December-January, the Facing History/ WWII Courses, and the 8th grade English lessons on the Holocaust. Information on NEW DOCUMENTARY FILM "The Holocaust: Memory and Legacy", featuring Boston-area Holocaust survivors, children of survivors, Holocaust educators and liberating World War II soldiers, and music from blues virtuoso Ronnie Earl, Klezmer musician Glenn Dickson (Shirim, Naftule's Dream), the Terezin Chamber Music Quartet, and singer Rosalie Gerut - Yom HaShoah film screenings are being scheduled and are printed here, to date. The Safer Alternatives Bill passed the Senate in January, 2008, but the legislative session ended before it got to the House. The bill is now being advanced during the current legislative session. Each year, I organize a group reading by published Brookline authors group event at Brookline Booksmith, 290 Harvard St., Coolidge Corner, during Brookline's First Light festival. The event, which is videotaped for Brookline Access TV (batv.org), is free and open to the public and refreshments are served. Brookline — When I first met local Holocaust survivors several years ago, I was so impressed that I decided to chronicle their stories. No easy feat, it was, rather, a three-year effort punctuated by tears on both sides, and a lot of encouragement. Although what initially drew me to them was their unexpectedly positive demeanor, many had not yet revealed their secrets. For those who had, the tales were no less painful in the retelling. Many survivors, though innately humble, understand that they can’t let their stories go untold. In addition, Holocaust denial hovers menacingly over them. And global genocides and massacres persist. Moreover, they are linked. In 1915, German officials helped pioneer deadly tactics in the Ottoman Empire that they later redeployed as SS officers. Rwandans taunted victims with emulations of Hitler. Rounding up of intellectuals, ditch digging, deportations, actualized racism, manipulation of fear and propaganda, cover-ups — eerily repeated, over and over. For all these reasons, it has become mandatory that the Nazi Holocaust be archived in any way possible. And so I moved beyond print, into visual media. And in creating a documentary based on the people in the book, I got to know them all over again. Without their trust and cooperation, I could not do this work. And remarkable town residents are among them. Ida Rozenberg escaped from a Siberian work camp with 13 others at midnight, on a wooden raft. During their six-day ordeal on the Volga River, a storm split the raft in two. They fixed it, and reached safety in the woods of Kazakhstan. When Ida tried to return to her native Poland, former neighbors threatened to kill her baby. Ida’s husband operated Paul’s Tailoring in Brookline Village for many years, and today, she helps serve lunch every Friday at her Hebrew SeniorLife residence on Beacon Street. Her companion, Ben Kuchinsky, creates Holocaust-themed artworks, displayed on the walls of the former Jewish Community Center in Cleveland Circle, that help him deal with his memories. Edgar Krasa of Chestnut Hill was the cook at the Terezin concentration camp, where Nazis imprisoned musicians, artists, actors and teachers. Despite starvation conditions and constant deportations to the dreaded East, they produced works like Hana Krasas (no relation) “Brundibar,” and the compositions of Gideon Klein and Viktor Ullmann. Those pieces are resurrected today by the Terezin Chamber Music Foundations Hawthorne String Quartet, spearheaded by Brookline resident Mark Ludwig. Rela Fund of Beacon Street was stripped of her pharmacology degree, and earned it all over again in Scotland. Children of survivors are imbued with a sense of purpose. Andy Fischer of Washington Square immerses himself in social justice law. Barbara Soifer’s civic contributions to our town are legendary. The same goes for liberating soldiers. Ellsworth “Al” Rosen, who helped form Facing History and Ourselves and was a longtime Brookline Library trustee, continues to speak out about what he saw. They all need to, because, sadly, Holocaust survivors and their progeny are often the first targets of those with vendettas against Israel or the Jewish people, who stake out a constant presence at Holocaust-related events. Yet, these innocent victims of inhumanity have nothing to do with their misplaced hatred. In fact, rather than wallow in their misery, they educated themselves, raised families and contributed extraordinarily, and sometimes, ultimately, to society, as can be seen in the cases of Liviu Librescu, the Virginia Tech professor who sacrificed himself for his students, and Brookline resident Joseph Helfgot, the donor in the country’s second face transplant. First-hand accounts are the surest way to counter both denial of history and continuation of genocide. The Holocaust cannot lose its impact. The stories must live on. Susie Davidson is a journalist, author, poet and filmmaker who wrote “I Refused to Die: Stories of Boston-Area Holocaust Survivors and Soldiers who Liberated the Concentration Camps of World War II,” and has just released a one-hour documentary film, “The Holocaust: Memory and Legacy,” narrated by Jordan Rich with music by Ronnie Earl. For local screenings, please visit www.SusieD.com. Brookline — Members of the Brookline Library Authors’ Collaborative will read from their works at Brookline Booksmith, 290 Harvard St., during Brookline’s 1st Light Festival on Thursday, Dec. 3, from 5-8 p.m. This year, BLAC will be joined by several Brookline authors, including Linda Barnes, author of the Carlotta Carlyle mystery series. Readers also include Wendy Lement, who co-authored “And Justice for Some: Exploring American Justice through Drama and Theatre.” Her theater production of “Cat Detective,” based on her children’s book “Keri Tarr: Cat Detective,” won the American Alliance for Theatre and Education’s 2002 Unpublished Playreading Project. Brookline Library Authors’ Collaborative members who will read will include film critic Dan Kimmel; journalist, author, poet and filmmaker Susie Davidson; bestselling mystery author Sarah Smith; and David Prerau, an expert on national time policies. Readings will encompass varied genres including children’s literature, mystery, crafts and cooking, history, fiction, nonfiction, horror and more. Refreshments will be served, and books suitable for holiday gifts by local authors will be available for signing. The event is free and open to the public. The Brookline Library Authors’ Collaborative meets on occasional Monday evenings at the Brookline Public Library, Main Branch, 361 Washington St.
BROOKLINE BOOK READINGS 12/3: 5-8 p.m. Dan Kimmel (The Jewish Advocate Movie Maven), Susie Davidson, Joshua Rubenstein, David Schmahmann, Monique Doyle Spencer, Linda Barnes and other authors read during Brookline's 1st Light festival. At Brookline Booksmith in Brookline. 617-566-7557. ...The Brookline Library Authors' Collaborative is a group for residents of Brookline who have had at least one book (fiction, or non-fiction, or poetry) published. The group, which formed in 2007, seeks to establish a network of authors that can help provide support for the artistic, social, and business aspects of writing books. Accomplishments thus far include the creation of a Virtual Bookshelf of local works, as well as group display cases at the Public Library; a Brookline Writes! show regularly aired on Brookline Cable Access TV; social events that have drawn new members; 1st Light Brookline readings at Brookline Booksmith, and an ongoing Yahoo! discussion group. The group meets on occasional Monday evenings at the Public Library of Brookline, 361 Washington St., Brookline. Susie Davidson is a journalist, author, poet and filmmaker who has written for the Jewish Advocate since 2000 as well as the weekly Tabs, and has contributed to the Boston Sunday Globe, the Boston Herald (op-ed), and the Forward. She has written “I Refused to Die: Stories of Boston-Area Holocaust Survivors and Soldiers who Liberated the Concentration Camps of World War II” (2005); Jewish Life in Postwar Germany” (2006); “Selected Poetry of Susie D” (2006); and edited a collection of remarks made by former German Consul to New England Wolfgang K. Vorwerk at area Holocaust community events (2008) (All Ibbetson Street Press, Somerville). She is also the Coordinator of the Boston chapter of The Coalition on the Environment and Jewish Life and a governing board member of the Alliance for a Healthy Tomorrow, and coordinates the Brookline Library Authors' Collaborative. Susie will read from her three books (all Ibbetson Street Press, Somerville). I organized this event with the help of Holocaust survivor Meyer Hack's friend, Dean Solomon, Boston attorney Andy Fischer and Armenian community officials. 400 people attended, including 8 state representatives and 4 state senators, and the event received front-page press as follows. My opinion piece, "Allying in Hope," which appeared in the Feb. 8, 2008 Watertown Tab and Press. Another event, "Genocide Committed, Genocide Denied, Genocide Repeated," held on Sunday, April 13 from 2-4 p.m. at the Armenian Museum and Library of America in Watertown, featured a panel of survivors and descendants of survivors of the Armenian Genocide, the Holocaust and the Rwandan Genocide. The victims of the Rwandan Genocide are commemorated on April 7; Armenian Genocide Memorial Day is April 24, and Yom HaShoah was May 1 in 2008. Wed., April 7, 10-11 a.m. (continuing on April 9, 16, 30 and May 7, 14, 21, 28) - Susie Davidson teaches an 8-session course, "What Can the Stories of Holocaust Survivors and Liberating Soldiers Teach Us in the Face of Continuing Global Genocide?" for Newton Center for Lifetime Learning, at Congegation Mishkan Tefilah, 300 Hammond Pond Parkway, Chestnut Hill, Mass. Information: Laurie Swett, Lifetime Learning Program Coordinator, 617-796-1000, l_swett@hotmail.com. **I moderate the e-groups ProgressiveChat@yahoogroups.com and LiberalsAndLeftistsForIsrael@yahoogroups.com. "Selected Poetry of Susie D." - released June, 2004 on Ibbetson Street Press of Somerville, Mass. - available through the poet/author or publisher. I have run poetry and music coffeehouses, hosted a poetry show on WZBC-FM and performed at First Night Boston, the Bread and Roses Festival in Lawrence, CBGB’s in NYC and I read regularly at various Boston/Cambridge venues. I won the 2002 Cambridge Poetry Award for Best Political Poem for "Viva La Causa, Viva Chavez," and was nominated for Best Political Poem and Best Love poem in 2003 and 2004, respectively. My poems also appear monthly in the Massachusetts Mensa Society's The Beacon as Susie D's Poetry Corner. I've also written for other local newspapers and music magazines. I've authored the poetry volumes "It's Only Life: Rhythmic Forays into Politics and Human Nature" (1992) and "After Gary" (1996). ..."Speaking of invincible, does sainted quarterback Tom Brady really have absolutely no idea why his friendship with the president — who has boasted of predatory behavior and villainized refugees and Muslims — might be a problem. “Why does everybody makes such a big deal? I don’t understand it,” Brady said on WEEI this week, apparently unmoved by the fact that millions had just taken to the streets to protest his friend. Oh, I don’t know, maybe because most of us would not choose to be such public buddies with people who say and do awful things? And it’s not just a friendship. Brady said he thought it would be great if Trump were president. And Trump, who is also tight with Pats coach Bill Belichick and owner Bob Kraft, brings Brady up whenever he gets a chance, boasting as recently as Thursday night about a congratulatory call from the quarterback. The Brady association helps sell Trump, and his intolerance, to America, just as surely as it sells sheepskin boots. Clueless or shameless? With Brady, it’s a toss-up." Noam Chomsky, from his 2002 book "Understanding Power": "Well, in our society, we have things that you might use your intelligence on, like politics, but people really can't get involved in them in a very serious way -- so what they do is they put their minds into other things, such as sports.... -- so you put a lot of the intelligence and the thought and the self-confidence into that. And I suppose that's also one of the basic functions it serves in the society in general: it occupies the population, and keeps them from trying to get involved with things that really matter. Recent reports about doctors’ real concerns about heart attacks suffered while watching games leave me baffled, as do all the accounts of all the physical and emotional suffering going on in our city this week. In fact, I have never understood the degree of time, energy and expense or the obsessive worship of sports figures in this town, let alone the time spent going to games and discussing them. Do people read other parts of the paper? To me, there are just too many pressing problems in our world that need our attention. To name a few: genocide, climate change and disappearing resources, toxins in our households, economic disparity, disease, urban violence, inadequate health care, housing, education and opportunity. These can all be worked on. Try it. Rather than suffering, and basing personal happiness on things outside of yourself (onto overcompensated players and managers you’ll never meet, and who leave for more money in a flash), I would suggest tackling the world’s problems instead. Your time is far too valuable to be so taken up by idol-worship and the belief that only winning championships matters. In the grand scheme of things, it doesn’t. I’m sure I’m one of few Bostonians happy over the results of the Patriots [team stats]-Colts game (Jan. 22). I’m happy there was no post-victory rioting or needless deaths, and I’m happy that a haughty coach and legions of hubris-driven, swaggering fans have been humbled. Mostly, I’m glad to know that there will be free time available to these obsessed minions that will hopefully be used toward a more conscientious purpose in our world than sports obsession. Maybe they’ll even have time to check out the true heroes - health care and human services workers, teachers and the like - and worship them instead of billionaire, profit-driven megalomanagers and men who happen to know how to toss pigskin around. Maybe now that the lowest of the low has occurred for Red Sox fans, they might think long and hard about their obsessive devotion to the team and the game. For years, I've bemoaned the fact that probably 90 percent of the people in Boston live and die for the Red Sox and worship their players and management like icons, while teachers, human services staff, health care providers, social workers and other admirable contributors to society barely make a living wage. I've decried the vast amounts of energy and time that go into watching, talking and reading about the Red Sox when there are so many, many critical problems facing our planet and its people, locally and globally. But if their most sacred and beloved idols Pedro and Johnny jumping ship for more dough at a moment's notice didn't affect Red Sox Nation, when a spiraling cost of $300 and up for family tickets didn't affect Red Sox Nation, then I don't hold out much hope that these lofty aims will. Instead, they'll ignore the fact that the team with the best players money can buy is the one that wins, they'll condemn anything that is less than a championship finish, and they'll begin waiting for next year. I also fronted the local spoken/postpunk/rock ensemble Sound the WORD!, which featured Dan Vigden on drums, John Grabill on guitar and keys, Josh Bloomer on bass and Charlotte Dore on backing vocals and Velvet Underground guitar. I caught the tail end of the late 60's-early 70's hippie music. I did the requisite headphone listening, partying and arena concert-going listening to Yes, King Crimson, ELP etc. during those years, but in 1980, I heard the WBCN "Wicked Good Time" compilation. From then on, I tuned into college radio and WFNX, and the punk and alternative of the late 70's and early 80's usurped all the hippie sounds for good. 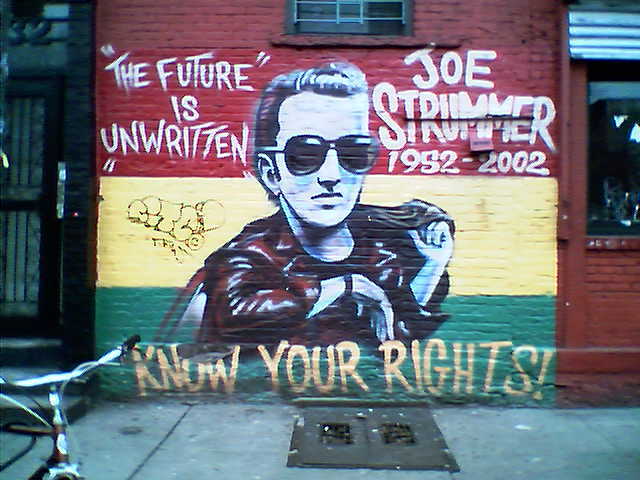 Just a few of my all-time favorite bands/musicians from this genre: The Alarm, Billy Bragg, Stiff Little Fingers, Morrissey and the Smiths, Joe Strummer and the Clash, XTC, the Go-Betweens, Midnight Oil, Buzzcocks, the Church, The Chills, the Fixx, English Beat, Echo and the Bunnymen, the Smithereens, Live, the Dictators, Patti Smith, The Jam, The Fall, Phil Ochs, Attila the Stockbroker, the Bevis Frond, Robyn Hitchcock, The Chameleons, Dead Can Dance, John Wesley Harding, Tuxedo Moon, Radiohead, Blur, Ramones, Stereolab, Interpol, Cabaret Voltaire, Xymox, Spiritualized. WHO LIBERATED THE CONCENTRATION CAMPS OF WORLD WAR II"
"Jewish Life in Germany - Past, Present and Future: Our Ten-Day Seminar"
"I Refused to Die," a three-year project, received a 2004 Mass. Cultural Commission and Brookine Arts Council grant. It has liner notes from Congressman Michael Capuano, State Secretary of Veterans' Services Thomas Kelley, Consul of Israel to New England Hillel Newman, and former Jewish Advocate editor Richard Ferrer. Media coverage has included the Boston Globe City Weekly, the Jewish Advocate, Spare Change News, the weekly Tab and the Somerville Journal. Another article will appear in the December "Our Town Brookline" magazine. A short online documentary of the book and the recent BPL reading with survivors Edgar Krasa, Rosian Zerner, Samuel Bak and Steve Ross, and Dachau liberating soldier Chan Rogers is currently being prepared by videographer Jeff Manzelli. 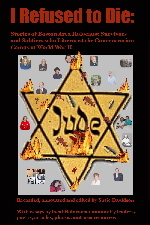 Documentary by Michael McAlpin included interviews with Susie Davidson, Holocaust survivor Stephan Ross and WWII liberating soldiers Chan Rogers and Sol Feingold from the book. JEWISH ADVOCATE ARTICLE OF MAY 27, 2005, by Logan Ritchie - available upon request. CHECK www.IRefusedToDie.com FOR UPCOMING READINGS with survivors and soldiers. The book can also be purchased through the author at 617-566-7557 or Susie_d@yahoo.com, or through the publisher at 617-628-2313 or ibbetsonpress@msn.com. "The words of Holocaust survivors and their liberators mark the end of an unspeakable world war and the beginning of new life for those who endured. Susie Davidson has done a remarkable job in capturing the depths of despair and the joys of salvation. The act of liberation will always be seared in the minds and hearts of those inside and outside the gates of the camps." “Sixty years ago, in the spring of 1945, Allied soldiers entered Nazi concentration camps and found evidence of an almost incomprehensible evil. But they also found survivors. In this volume, Susie Davidson gives us the testimony of both survivors and liberators: encounters between those who had defied death and those who had risked death in the same cause, to preserve human freedom and human dignity. "In writing this book, Susie Davidson is advancing the eternal message of the most significant event in Jewish history. In doing so, she is fulfilling a most important service to the entire community. The Holocaust was an essential element in the establishment of the State of Israel, which reserves an official national day for honoring its memory. Its lessons are the most profound and the most crucial in the creation of our modern Jewish identity. Susie's effort to document the story of these remarkable survivors and the brave soldiers who liberated the camps is to be supported and is greatly appreciated." I want to send you a formal thank you for the magnificent (yes, I sincerely mean that word, and in my seven-plus years of chairing this series, I have never before used it to describe a talk) lecture and reading you gave us this morning. May I have an address that I can send the letter to? Recipient of a 2004 Massachusetts Cultural Council/Brookline Arts Commission grant, the book includes 30 personal stories (20 survivors, 10 soldiers) recorded, annotated, edited and in most cases written by Davidson. The purpose is to document and honor the bravery and accomplishments of the contributing survivors and World War II soldiers, and to confront Holocaust denial and help to stem genocides in our modern world. Included are the stories of Boston-based Holocaust survivors Janet Applefield, Israel Arbeiter, Samuel Bak, Rena Finder, Sevek Fishman, Rela Fund, Michael Gruenbaum, Meyer and Sylvia Hack, Edgar Krasa, Michael Kraus, Ben Kuchinsky, Tania Lefman, Joe Matzner, Stella Penzer, Liane Reif-Lehrer, Stephan Ross, Ida Rozenberg, Chana Seldin, Sonia Weitz and Rosian Zerner, as well as those of local World War II veterans James B. Aitken, Leo Barry, Sol Feingold, (Commissioner Emeritus of the Mass. Dept. of Veterans’ Services) Tom Materazzo, Phil Minsky, Warren Emerson Priest, Chan Rogers and Al Rosen, who liberated the camps. Former Colorado Supreme Court Justice General Felix L. Sparks, Battalion Commander of the 45th Division’s 157 Infantry Regiment that liberated Dachau, has also graciously contributed his personal story to this book. The book contains essays by Boston-area Holocaust community leaders who include Ellen Ogintz Fishman, Director of Holocaust Services at the Jewish Family and Children’s Service, Boston; Nancy Kaufman, Executive Director, JCRC of Greater Boston; Jennifer Hsu Larratt-Smith, New England Program Assistant at Facing History and Ourselves, Brookline; Matt Lebovic, Holocaust Programs Coordinator, JCRC of Greater Boston; Mark Ludwig, Director of the Terezín Chamber Music Foundation; Rick Mann, President of the Friends of the New England Holocaust Memorial; Julie B. Ross, President of Generations After; Boston City Councilor Michael P. Ross; Dale Carmen Sibor, daughter of NEHM benefactor Bill Carmen; and Regina Szwadzka, Director of International Services of Project Search, American Red Cross of Massachusetts Bay. Included are many Holocaust-themed poems from area poets, as well as articles, photos, and local and national Holocaust community resources, as well as supplementary educational segments on World War II. For information, books or readings with soldiers and survivors, please call 617-566-7557, email Susie_d@yahoo.com or visit www.SusieD.com, or contact Ibbetson Street Press of Somerville at 617-628-2313, ibbetsonpress@msn.com, or visit www.ibbetsonpress.com. The book is published on the 60th anniversary year of the Allied defeat of the Nazis, in honor of the 10th anniversary of the New England Holocaust Memorial and in recognition of the Liberators' Monument in downtown Boston, as well as the work of the American Association of Jewish Holocaust Survivors, based in Newton. Here are some of my recent letters written to whomever on whatever!